I’ve been overweight as long as I can remember, since at least third or fourth grade. I was a girl who loved to eat, and my family knew how to cook! I would feast on casseroles, fried chicken, chips, cheese… and of course, anything sweet. Soda was my drink of choice. Being chubby through elementary school and middle school translated into being “a big girl” in high school. I was up to a juniors size 13 by my sophomore year: not huge, but definitely big enough that it caused me a bit of anxiety socially, and made me feel very different from my slender friends who seemed to be totally self-confident. I wasn’t athletic, and didn’t consider myself attractive. I still had friends, and a boyfriend, but my weight was a constant issue dragging down my self-esteem. Then, at the beginning of my junior year of high school, I got pregnant. Typical careless teenagers. My boyfriend and I were terrified, but we decided to keep the baby and get married, against the better advice of our families. I had a healthy pregnancy, a c-section delivery, and a rocky marriage (of course). Even with the added stress of being a teen mom and wife, I managed to graduate high school in 2009 as valedictorian of my class. But despite my accomplishments, my self-worth was at an all time low. I was 170 lbs at 5’7, and felt as though I didn’t belong anywhere. 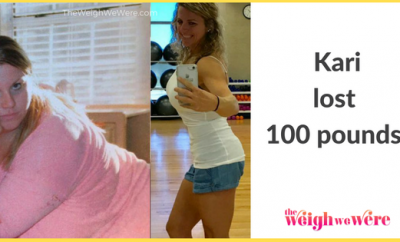 My high school friends were headed to out-of-state colleges, my husband (a year older than me) was working crazy hours to try and make ends meet, I was struggling to raise a toddler… and after graduation, the weight kept coming. Over the next two years, I attended college at a nearby public university, worked nights to make money to support my family, and tried to wrestle with the unhealthy relationship I was in (caused by both of us growing up and growing apart, as young people in relationships do). We eventually divorced, and I had to drop out of college in order to work longer hours to support myself and my son. By 2011, I was up to 185 lbs, and despite my own (terrible) self-image, I met a great guy and we hit it off. He took me on dates, treated me wonderfully, was an amazing friend and father figure to me son… and he asked me to be his girlfriend. 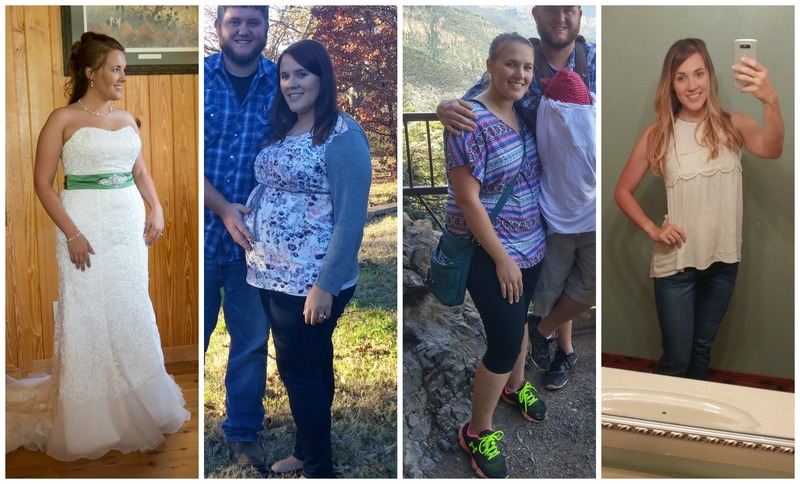 By the end of my pregnancy I weighed 230 lbs, and pointedly looked away from the scale at every doctor’s appointment. After the birth of my second son, some of the pregnancy came off (I was breastfeeding exclusively, which helped), but I was still absolutely devastated about it. My size 16 jeans were tight. My shape was gone. My body felt foreign to me. What should have been a joyous time was marred by the moments I spent looking in the mirror, crying to my ever-supportive husband: what have I done to myself? My weight has been a constant source of anxiety since I was young. It held me back from participating in events I would have enjoyed… I was scared to put myself out there, for fear of judgement. Looking back, I know that no one would have cared. I wasn’t “that big,” and even if I was, people are much more worried about themselves than they are anyone else! But my own feelings about my weight were the building blocks for a cage that I put myself in. “I don’t dance.” “I don’t swim.” “I don’t play volleyball.” “I don’t like shorts.” And the list goes on. In June of 2015, I went with my husband and in-laws on a trip to see one of his sisters. She lives in Colorado, and although I’d been there when I was a child, I don’t really remember it. So, I was excited for the experience! At this point, my oldest son had just turned 7, and our baby was a fresh-faced 5 month old. On our first full day in Colorado, we went to an awesome amusement park on top of a mountain. They had delicious homemade fudge, a great gift shop, laser tag, a huge swing that LITERALLY suspends you over a giant cliff… we had a LOT of fun, and the views were spectacular. Towards the end of the day, we went on a tour of one of the caves on the mountain. The guide took us through, pointing out interesting rock formations and telling us about the cave and the town’s history. At the end of the tour, we came out onto a viewing point, with the beautiful mountains in the background. I gave my phone to my sister-in-law and asked her to snap a picture of my family in this picturesque setting. We smiled, she clicked. All in all, a wonderful day. Later, at the hotel, I was scrolling through my pictures from the day and got to that one. It made me catch my breath. My husband, the baby sleeping in a carrier on his chest, grinning with his arm around me. My older son, red-cheeked, wind blown hair… and me. It was the worst picture I had ever seen of myself. My face was red and sweaty (from walking slowly through a cool cave), I was slouching a bit (again, tired from our stroll)… and I had no waist. The shirt I thought was flattering because it was a bit flowy was a tent, but it did nothing to conceal my fat. I cried in the hotel room. Showed the picture to my husband, and, to his credit, he told me that in his eyes I am more beautiful every day. (He really is a saint.) Cried more. And that very night I resolved to make a change, a real change, and take back control of my body. I went through the cave, and it showed me the writing on the wall. 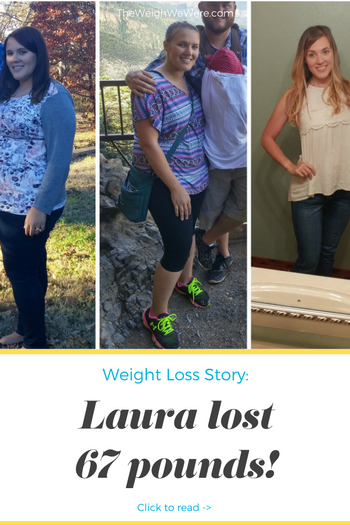 When we got home from our trip, I stepped on the scale for the first time since giving birth five months before. I weighed 199 lbs. For the rest of that summer, I made small changes. Switched from regular Coke to Diet, had smaller portions and skipped dessert. Went for walks. Slowly but surely, my weight started to come off. I lost 14 lbs from June to August. On my 24th birthday (August 6th), I put on a swimsuit and went to the beach with my family. My husband took a picture of me with the kids, and when I looked at it, I could see that I was smaller. On that day I weighed 185 lbs. That picture gave me motivation to continue. I knew I could do it! Something that was very difficult to me was dealing with my appetite! I was still exclusively breastfeeding my youngest son, and as a result I was hungry constantly. I had to consciously make good food choices, like snacking on carrots instead of chips. I did it, but it was hard! Knowing that I was not only making better nutritional decisions for myself, but for my son, helped me stick to my guns. I don’t want my children to deal with the same issues I did. Even though I was motivated after our beach trip, I was still frustrated by my slow progress. I knew I could do better. I put on my research cap and got on the internet, and that’s when I found a community on Reddit called LoseIt. Their forum was overflowing with stories of people’s successes, advice, and encouragement. LoseIt taught me how to correctly count calories, using a free app called MyFitnessPal. With MyFitnessPal, a kitchen scale to weigh my food to ensure correct portions, and constant inspiration from the Reddit community, my weight loss was reinvigorated. 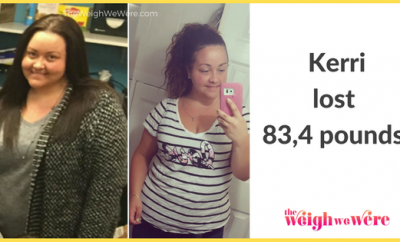 I went from losing 1 lb a week to losing 2, and being able to see faster results kept me motivated. 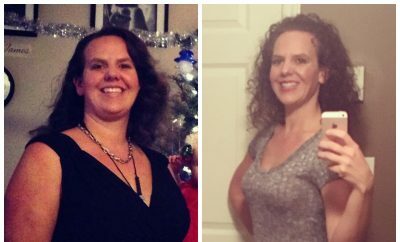 When I reached 149 lbs, my original goal (and a loss of 50 lbs! ), I stalled. Because I had reached my goal, I felt able to reward myself, and unfortunately I had conditioned myself to do so with food. Cakes, cookies, cheese, you name it. I didn’t eat enough to gain back any weight, but I stayed at that point for awhile. Finally, I redefined my goal weight, aimed for 135, and was off again, eating at a caloric deficit. I lost most of the weight after I began counting calories in August. From August to March I lost 50 lbs. Every day on my journey was a non-scale victory. The day I fit back into a pair of size 11 jeans and a t-shirt from high school, I sent a picture to my mother. She couldn’t believe it. A few weeks later I bought a pair of size 8 jeans, the first time I could remember in my life being in a single-digit size. I cried in the dressing room. The smaller sizes kept coming. Now, at 132 lbs, I wear a size 4 in jeans. When I was gaining weight, and at my heaviest, I ate whatever I wanted. My husband and I would go out to eat several times a week, for Mexican food, or at the Chinese buffet. I would eat plate after plate, chip after chip. Almost every time we had fast food, I would eat a shake along with my burger and fries. Today, I eat between 1400 and 1700 calories a day, depending on my activity level. Breakfast is usually something with eggs and veggies, like an omelette, or maybe a bowl of oatmeal. Lunch is a protein (chicken breast, sliced turkey) and more vegetables (I LOVE SteamFresh veggies–so easy to throw in the microwave and perfect for my husband and I to share). Dinner is my largest meal of the day, but I try to keep it healthy. For instance, if we have spaghetti, I might make it with spaghetti squash instead of pasta! I frequently snack on Greek yogurt and fruit, too. Of course, there are days that I do not track my food at all and indulge as I want, usually at social events and holidays. I do not feel bad eating a slice of birthday cake. I don’t feel bad having a few glasses of wine with my friends. But I know now that indulging means it is a *sometimes* thing, not an every day thing! Once I got to 150 lbs, I started jogging (slowly) a few times a week. After that, again through the influence of Reddit’s LoseIt and XXFitness communities, I decided to really commit: my husband and I are nearly done with the Couch25k program, and have a weight set here at home that we use to strength train. Now, I do cardio three times a week, and strength training three times a week. I feel better physically than I have my whole life. It’s all about calories in < calories out! It doesn’t matter WHAT you eat, if you eat 3,000 calories worth of broccoli a day you won’t lose weight. If you eat 1,200 calories worth of cake, you will! However, making better nutritional choices is still key: you might lose weight eating only cake, but your body will NOT thank you. Focusing on lean proteins and vegetables will allow you to stay under your calorie goal and still feel satisfied! You don’t have to eat until your full. Hunger is a normal thing. Sometimes, you have to embrace feeling hungry for an hour until your next meal! When counting calories, a small kitchen scale is absolutely indispensable. 1 oz of cheddar cheese has 110 calories. If you eyeball it and end up with 1.5 oz, that’s a 55 calorie difference! One serving of peanut butter has 190 calories, and a serving is SMALL. Weighing your portion in grams allows you to make SURE you’re only having 190 calories worth, and not 300 or 400. Tracking, weighing, and limiting your portions seems SO HARD at first. When I got my food scale, it would take an extra 20 minutes per meal to count it all out and add it into the app on my phone. But after a few weeks, it was second nature. Now, I spend maybe 10 minutes a day weighing and tracking my food. Don’t be scared of something new! “Perfect is the enemy of good.”You don’t have to be perfect. Counting calories is not an exact science. Do your best, don’t stress about small things here or there, and you will see results!